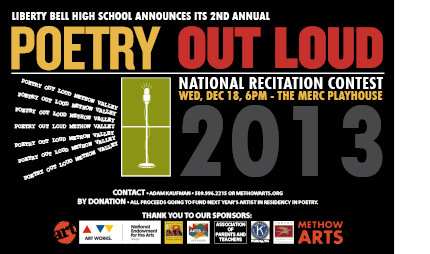 Join Liberty Bell High School students on Wednesday, December 18 for the 2nd annual school contest for Poetry Out Loud: National Recitation Contest. The competition, presented in partnership with the Washington State Arts Commission, the National Endowment for the Arts, the Poetry Foundation, the Public School Funding Alliance, Winthrop Kiwanis, the Association of Parents and Teachers and Methow Arts, is part of a national program that encourages high school students to learn about poetry through memorization, performance, and competition. Thirteen students from Liberty Bell H.S. and the Independent Learning Center will participate in the Poetry Out Loud school contest at The Merc Playhouse. The winner of this competition will advance to the Eastern Washington Regional Poetry Out Loud contest in Spokane. The Washington State champion will advance to the Poetry Out Loud National Finals in Washington, DC, where $50,000 in awards and school stipends will be distributed. Featured speakers and participants are classroom winners from grades 9-12 in the Methow Valley School District. 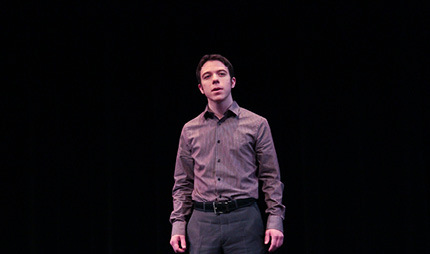 Tom Zbyszewski, 2012 Methow Valley senior student, was runner up in the 2012 Washington State Poetry Out Loud Competition in Olympia.